When you use LinkedIn to post a job request, the screening part of your hiring process clearly benefits. Rather than asking for references from the applicant and ordering a background check from a services company, you can use LinkedIn to verify a lot of the information in your applicant’s resume and application at any stage of the process, without paying a dime! Start by checking for the applicant’s LinkedIn profile. If the applicant has a common name, use additional information from her resume or application (such as past jobs, location, or education) to narrow your search. When you find her profile, compare it with her resume or application. Is she consistent in how she presents her experience? Read through the applicant’s recommendations and follow up. If your candidate has received recommendations, go through them, pay attention to the date the recommendation was written, and see whether any are applicable toward your open position. Pay particular attention to recommendations from former bosses or co-workers. If necessary, ask your candidate whether you can contact the recommender through InMail and use that person as a reference. See whether you’re connected to your candidate. When you pull up your candidate’s profile, you see whether she is a second- or third-degree network member, which would mean there are one or two people who connect you with the candidate. If so, contact that person (or ask for an introduction to reach the correct party) and ask for more information about the candidate. Chances are good that you will get a more honest assessment from someone you know rather than the recommendations provided by the candidate. Understand, however, that while the two people may be connected, they may not know each other that well, or their connection may be outside the professional expertise you’re looking to learn about from this job candidate. Evaluate the candidate’s total picture. 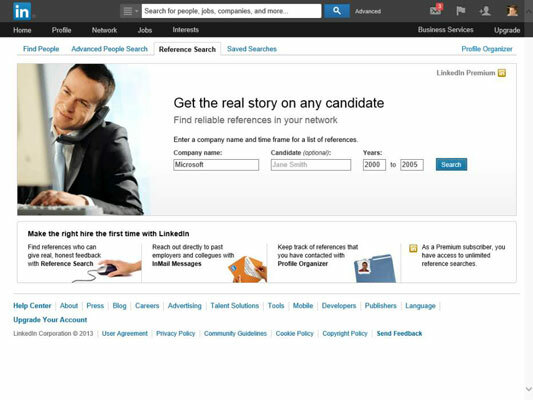 If your candidate mentions any websites, blogs, or other web presences in her LinkedIn profile, click the links and see how they’re involved. Take a look at the listed interests and group affiliations and see whether they add to (or detract from) your picture of the job candidate. Because most LinkedIn users have already defined each company where they worked and the years of employment, LinkedIn offers an interesting and helpful application called Reference Search. It works like this: Say you’re evaluating a candidate who says he worked at Microsoft from 2000 to 2005. You’d like to find out whether you know anyone in your immediate or extended network who might have worked with your candidate. LinkedIn scans everyone’s profile and looks for matches in the company name and years employed and shows you possible matches. You can then follow up and hopefully get a much more honest, unbiased opinion of the candidate than someone the candidate has pre-selected to deliver a glowing recommendation. Beware, though, in case you get the ex-employee with an axe to grind. There is one catch: You must have a paid premium account in order to use Reference Search. When you get to the Reference Search screen, it should bring up a window. Enter the company name and years of employment in the text boxes provided. If the candidate is currently working at the company, enter the current year in the second year box. You can enter more than one company in the boxes provided; your results list contains anyone who matches at least one of the companies provided. If you like, you can also enter the candidate’s name in the box provided. Click the Search button to start the reference search. You see a results screen that summarizes the number of first-degree connections as well as the number of their friends who match your reference search. If you have a premium account — or decide to take the plunge to upgrade — you can evaluate each profile in your results list to see whether the applicant worked in the same division, and if so, contact the person in your results list for a reference. 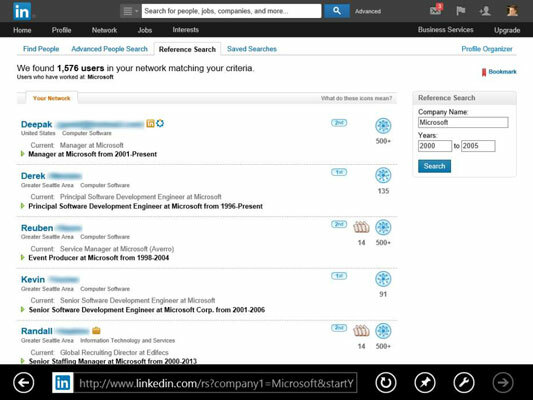 Obviously, for a big company, you may have to search multiple people to find the right division. If you add a division name right after the company name (for example, you put Microsoft Excel instead of Microsoft), you severely limit your search to people who have defined their positions in that exact word order.